Think about how you had to advertise your business 10 years ago. Now, let’s look back just 5 years. Have you noticed any changes? From coupons to word of mouth, to audiovisuals, you can now find all forms of advertising online with potentially limitless reach. For business owners that have cultivated their brands and gained customers through traditional means over the years, looking for new avenues like online marketing can seem strange and frightening. There are many new variables to understand, and learning the terminology and processes can make even the most knowledgeable business owner’s head spin. 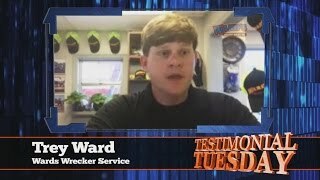 In this case study, we’re going to analyze CP Wrecker Service in Auburn, Alabama. Before coming on board with OMG National in April of 2016, they had a very minimal online presence and no website. They had worked with other agencies before and came on board with a sour taste due to lack of communication and little to no results. The first step of our multi-pronged marketing strategy was to introduce CP Wrecker Service into our Power Network comprised of 80+ of the most important directory listing sites available. We began carefully crafting CP Wrecker’s most current business information, service descriptions, SEO tagged images, custom video, and special service offers throughout their online presence. “Close client communication was important” Heather Richards, Dispatch Manager at CP Wrecker Service said. We found that when our business changed, or if we added a new truck for a new service, all we had to do was let them know and it was put into our marketing - our customers immediately found what they were looking for”. While this was happening, the second part of their success was addressed. This came in the form of a custom designed WordPress website that focused on the company’s core services, areas of operation, and their competitive advantages within the market. Mobily optimized and with SEO best practices in mind, CP Wrecker’s new website resulted in an immediate increase in search visibility as well as customer contacts. When asked about the real world success of their website, Heather went on to say “we’ve had several customers mention that our site came up immediately for them when they searched for a tow on their mobile phones”. She continued to note that “It made it really easy for them (customers) to see what other people were saying about us because of the reviews that we were able to capture and have displayed on the site”. Leveraging social media, OMG National was able to then direct traffic towards the website while creating an awareness campaign of CP Wrecker’s services. By implementing our proprietary review platform, Review Stream 3, we were able to grow their organic search results through the addition of first party reviews as well as review balance towards third-party websites in order to grow their online review presence. Fast forward to now and CP Wrecker Service has “seen a 100% increase in cash calls in the past year” Heather was delighted to say. According to their Google My Business insights for September, they appeared on over 2200 searches leading to 107 organic phone calls. This is a direct result of integrating CP Wrecker into OMG National’s Partner Program and our three pillar system (Directories, Reviews, and Social Media). As the times change, so does advertising and marketing. What worked 10 years ago, doesn’t today; and what works today, won’t 10 years from now. Trust in the experts to keep your business in the eyes of consumers with innovative, results-driven strategies sure to get your phones ringing and customers through the doors. Welcome to the OMG National family. Our Solutions, Your Success. In an industry where every moment counts, your business needs to know that the marketing and advertising efforts are being handled. OMG Tow Marketing is there to ease your mind and make sure your business is getting noticed while you focus on making your company grow. The towing and roadside assistance industry is fast-paced and constantly changing. You need a marketing company that can keep up, and understands the ever-changing environment and challenges faced by businesses every day. That’s where the pro’s at OMG Tow Marketing comes in. With over 25 years of serving tow companies all over the United States and a dedicated team of Account Executives and creatives, we understand what it takes to make an impact in the competitive towing landscape.